A series of cold fronts this week has finally brought more seasonable temperatures, so it’s safe to say that fall is officially in full swing. A blocking pattern over the Pacific has kept the elongated trough over the eastern US and Colorado under northwesterly flow aloft. Drier air seen the water vapor imagery below has been circulating over the state and keeping conditions mostly dry. The cold fronts have produced some moisture return behind them, but the limited low-level moisture has keep post-frontal upslope showers and thunderstorms more scattered in nature and never more than one day in a row. There is slightly higher moisture over the CO/NM border, which has helped produce some high-based light showers to the area the last couple of days, but totals have generally remained below 0.1 inches. A change in the weather is expected at the end of this weekend as the cutoff low over the Pacific gets absorbed into the westerly winds and progresses eastward. Tonight, it is worth mentioning that a cold front will move south through eastern Colorado. Expecting high clouds to start increasing from the north to the south this afternoon with the approaching system. By tomorrow temperatures will be coolest over the plains and lower foothills. Not much moisture or deep cold air with this surge, so only expecting increased cloud cover and possibly a few sprinkles. Temperatures by Saturday are forecast to spring back with highs reaching the mid-80Fs over the plains . As the upper-level low gets absorbed into the main flow beginning tomorrow, it first moves eastward, and then north once it reaches California. This will turn the northwesterly flow aloft to westerly beginning tomorrow and last through this weekend. The westerly flow will promote dry weather with slightly above average temperatures for this weekend. Stronger winds aloft will likely mixed down to the surface on Saturday, so a fire weather watch has been issued for northwest Colorado. On Sunday, the cutoff low passes north of the state and some extra mid-level energy will pair with a slight increase in moisture for some showers over the western high terrains. This is when the forecast gets interesting. The trough pattern over the Pacific continues after the cutoff low moves eastward beginning tomorrow. The vorticity max marked below settles into the same general region as the prior cut off low, which will control the upper-level flow. At the same time the trough moves into place, Tropical Cyclone Rosa (green in the image below) will be moving north along the Baja. The upper-level low will push the northern moving cyclone east, which could bring abundant tropical moisture over and near the western portion of the state in a normally quiet precipitation month. 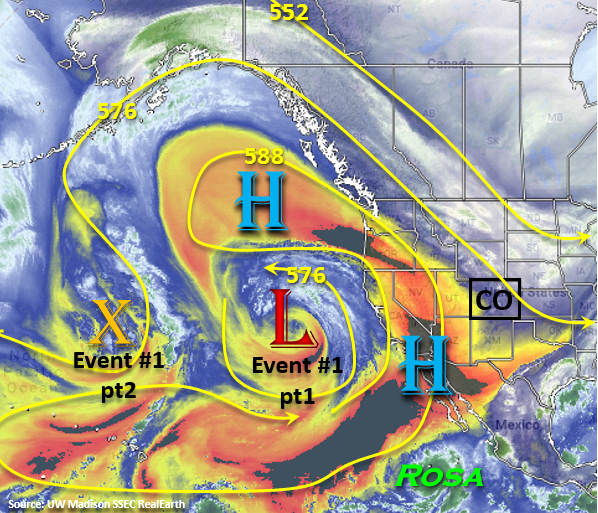 Paired with upper-level dynamics and topographic influences, heavy rainfall may be possible the first half of next week over the southwest corner and south Central Mountains. Though specific timing is still a little uncertain, an Elevated flood threat has been issued as models have become more consistent with this solution in their runs over the last two days. 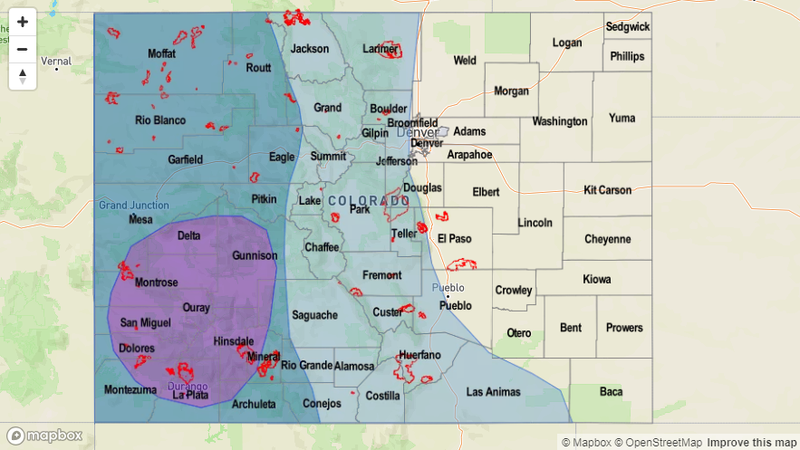 We saw a similar situation early this year with Bud, but generally speaking, these hurricane remnant rainfall events are very rare for Colorado. Towards the end of the week, the trough will transition eastward, which will keep showers and thunderstorms in the forecast. However, the flood threat drops off after the remnants of Rosa move through the state. Diving into the moisture plumes from the GEFS, not much threat until early next week as the tropical cyclone moisture tracks into the area. The European model is also projecting a similar solution with Rosa, but the timing is a bit more delayed. We’re just now entering the 5-day forecast, which is more accurate in the sense model members come into better agreement about the atmospheric set up. This means there will be a better idea of the timing and location of the rainfall later this weekend, though right now it looks like a western Colorado event. PW looks to possibly reach just below 1 inch over Grand Junction, which is above the 95th percentile for this time of year (October record – 1.04 inches). With the largest PW values expected over the San Juan Mountains and southwest corner of the state, expecting the highest rainfall totals here as well. There is still quite a bit of spread with the moisture return between the model members, which has to do with the uncertainty in the exact path of Rosa. Although the Flood Threat Bulletin comes to an end on September 30th, special forecasts will be issued next week if there is a flood threat for a region or recent burn scar(s). Below we describe the identified precipitation event of this FTO in more detail. Elevated/No Apparent Threat as tropical moisture associated with Hurricane Rosa is pulled into the state. As mentioned above, still quite a bit of uncertainty with this forecast. At this time, global models are pulling the remnants of Rosa near/over the state. Still quite a bit of uncertainty as to where the best moisture will end up, but this is looking like a significant October rainfall event for western Colorado. Currently, models are keeping the moisture confined to western Colorado, but this may change with future runs. The GFS has the moisture plume reaching the southwest corner of the state by Monday, whereas the ECMWF (European model) is holding off another 24-hours. Models will likely come into better agreement later this weekend. Heavy rainfall is anticipated despite fairly quick storm motion as PW values will be near record values for October. Threats include mud flow, debris slides and local stream flooding with burn scars being the most susceptible to these threats. The FTB ends on September 30; however, if a flood threat appears, we will be doing special Flood Threat Bulletin(s) as warranted.